What would be your Top Ten Best Scents For Christmas? 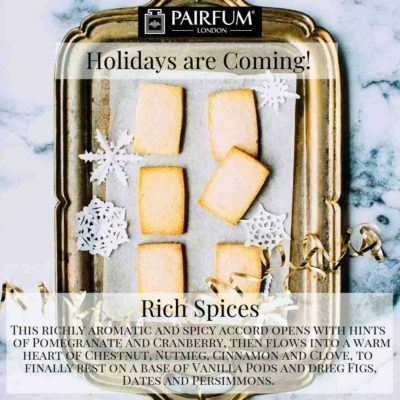 At PAIRFUM London we think that It’s beginning to smell a lot like Christmas! Would it be the smell of a fresh batch of Nutmeg, Cinnamon & Orange cookies straight from the oven? Or, how about the scent of a wood fire crackling in the hearth? Maybe it is the fresh green pine scent of a a real Christmas tree? How about roasted chestnuts, I am not sure how many families still do this at home, but no Christmas fair is complete without them? Gingerbread for all the bakers and the decorators(cakes that is) in all of us, decorating gingerbread cookies and or houses have become a tradition for many. Peppermint, well it must be a favourite as even Santa loves handing out candy canes, at every corner. 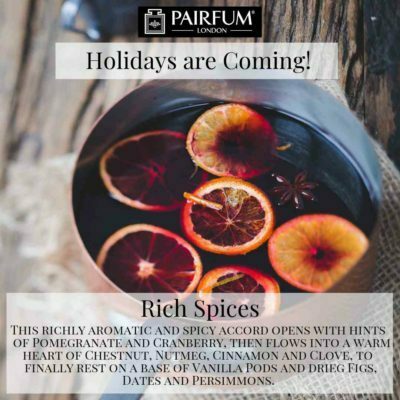 We could not have a – Top Ten Best Scents For Christmas – and not include Mulled Wine..
We all have different memories of the holidays, some will recall those same positive feelings from simply experiencing the same scents, sounds or sights. For those of you starting your own family, it is the perfect time to create new memories & create your own traditions to add to the Christmas Story. So however or wherever you plan to celebrate the festive season, we here at PAIRFUM wish you a Happy, Healthy, Holiday. Enjoy shopping for Home Fragrance in our Online Boutique!